All lasers look fantastic when projected through haze or fog, which shows them off to their best effect. However, starcluster, Gobo and plasma lasers look good when projected onto walls or ceilings in venues where it is not possible or desirable to use atmospheric effects. Although amongst the most exciting of lighting effects, lasers are potentially hazardous and care needs to be taken when positioning them and directing their beams to avoid contact with audiences eyes. They are rented with this warning and at the hirer’s risk. A small 30mW green pattern laser, creating the classic fans and tunnels. Best used with a fogger to create best effect. 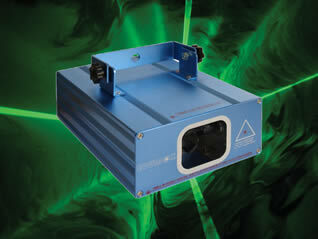 Compact but powerful laser with green and blue diodes, which when mixed creates cyan. 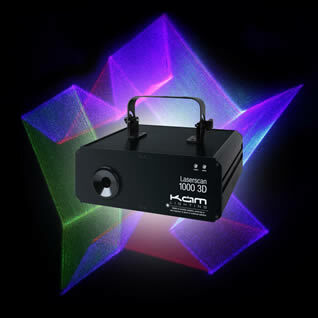 Giving both beam effects and animations, this laser has a remote control to access different settings and colours, which can also be controlled by DMX. 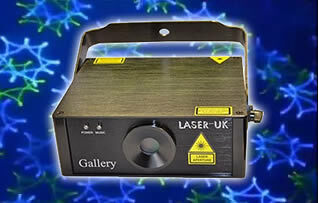 A full colour 300mW laser in a really compact case. This is a beam tunnel and wave style laser and has no inbuilt animations. The patterns settings and colours can be accessed by the include remote control or by DMX. They can also be linked to work together as a pair in master slave mode where they look particularly effective. 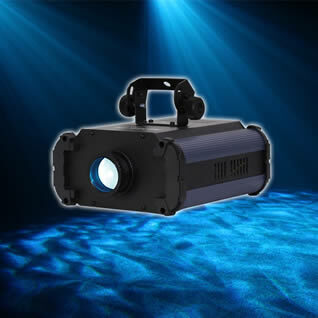 A brilliant blue laser with a powerful true blue 300mw diode, giving great tunnel, wave and beam effects along with animations. Superb with haze or fog. 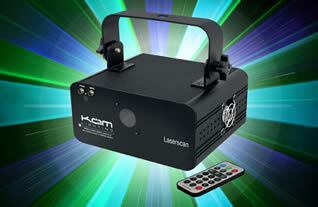 A stunning multi-function laser which includes 5 separate effects in one unit. These include multiple patterns, plasma effect, 3D shapes, 3D kaleidoscope effects as well as stunning beams. It has 3 colour diodes – Red, green and blue, achieving full multi-colour output at high power. Usable for many of these effects without the need for haze or fog, but superb with it. Controllable via ILDA and DMX interfaces, but operates well in sound to light and manual modes, selectable via the control panel on-board. 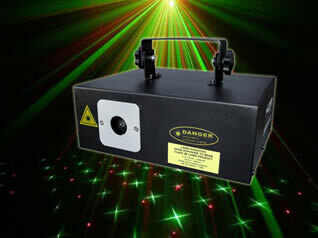 A very high powered 2.6watt laser suitable for large displays or club use. 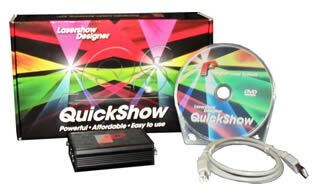 It has high speed galvos for smooth patterns and shapes and a full ILDA interface via which it is essential to control it using the appropriate software interface (see Pangolin Quickshow below). 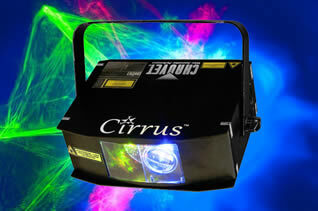 A high powered smoke machine is also required to get the best out of this superb laser. Supplied with safety interlock. NB This is very powerful laser and if used inappropriately could cause serious damage to eyesight. We will only rent this to experienced laser users and you will need to prove your credentials. We accept no responsibility for misuse of this or any other laser. ILDA based software and interface to give excellent control over ILDA equipped lasers. The Software, which is free to download (but which will not operate the laser without the supplied dongle), includes a huge number of inbuilt patterns and animations giving you an instant show with little or no pre-programming required. However we recommend that this software is only used by experienced laser users as if used incorrectly it could be potentially dangerous to an audience. Requires a Windows based PC/laptop to operate (not supplied). A 100mW red and 40mW green starcluster laser that sends hundreds of split laser beams scattering all over the room. Patterns spin, rotate and pulse in time with the music. A truly memorable effect that doesn’t need fog. 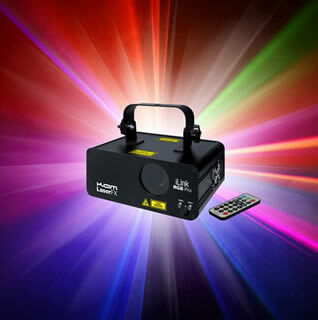 A red and green gobo laser, the Atria can create full blown clustered imagery that flips, spins and rotates to the beat of the music. The added function of DMX allows the user to manually access the 13 DMX channels and many patterns and images that look great with or without fog. A gobo laser in green and blue that produces 79 different patterns, fully controllable through DMX, via the LED input on the rear panel or operational in standalone and sound to light modes. It looks good with or without fog. 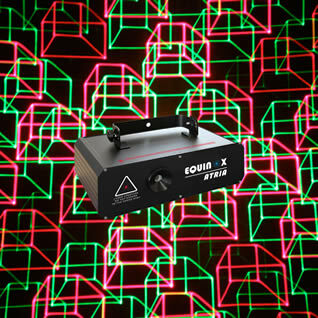 Red and green laser clouds combine with a bright blue LED to create ethereal projection effects on the wall or ceiling of the venue. They are fully adjustable using the controls onboard or can be left to run in sound to light or automatic modes. 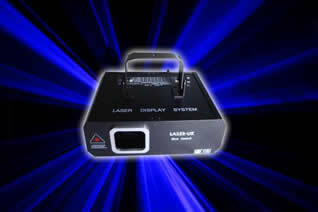 Another laser that doesn’t need haze to enhance it. 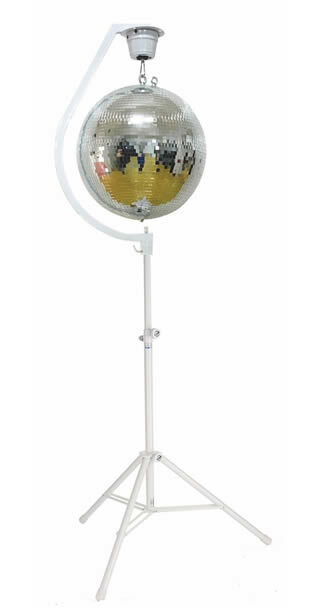 A remarkable LED strobe that has another trick up it’s sleeve, doubling as a stage blinder. 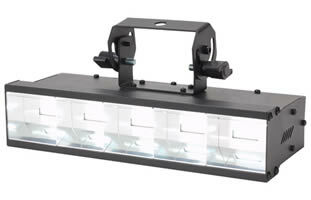 Comprising of 5 cells, each powered by a very bright 5w LED, the light operates in traditional strobe mode with variable speed and can also be dimmed. In addition several inbuilt programmes create an excellent light show, particularly when linked in pairs or more. Controllable by a CA8 which is included or via DMX. 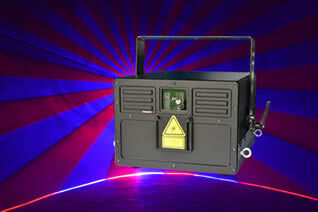 A high powered 100w with excellent strobing and audience blinder capabilities. It is fully controllable via DMX. 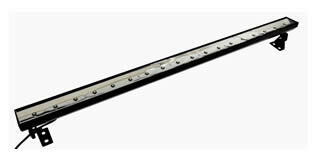 A powerful 16w LED UV micro bar, with full DMX control. 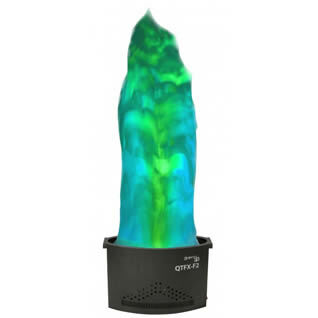 It is fully dimmable and strobing and has in-built sound active programming to create interesting effects. Bright enough for stage work or special effects for a Halloween or UV party. 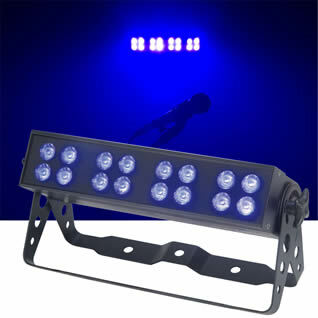 For UV effects see also American DJ Ultra Bar Hex and 12p Hex fixtures on the Stage and Band lighting page. This excellent fixture employs a 100W COB LED UV source, combined with a special parabolic reflector built in aluminium which develops an extremely bright and homogeneous 80° output. 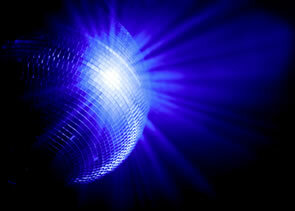 It creates a wide flood of UV light and is one of the brightest on the market. It is possible to dim it if this is too bright via the on-board control panel or via DMX. If a tighter beam is required 25°, 40° and 50° lenses are also included. Using a powerful 100watt LED source, this is the ideal fixture to create a water effect, creating gentle ripples across the projected surfaces. It has both seamless scrolling and static colours, produced by the separate dichroic colour and glass effect wheels. This fixture is capable of washing walls and ceilings in a realistic vivid sea of tranquillity. 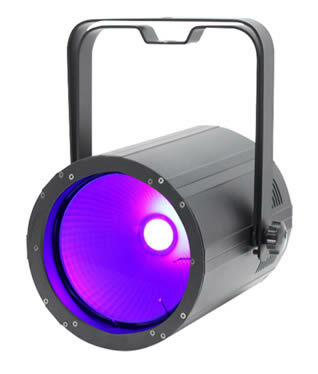 For the ultimate in flame lights, this fixture can produce flames in the colour you want by mixing RGB LEDs onto it’s 1.5m flame through the on-board control panel or via DMX. The flames can also change colour in time with the music or remain static. They can also be linked as pairs to duplicate each other. Please be aware that the 50cm ball is very large and will need a large vehicle in which to transport it in its flight case. This will not fit in the back of a compact hatchback car. Supplied with a rotator that can be affixed to trussing (clamps supplied for standard 35mm chord truss) or screwed onto a beam. Supplied with a white Curve Max hanging bracket with integrated rotator and white tripod stand of adjustable height up to 1.8 metres. If you need to go higher then we can supply black lighting stands that reach up to 2.8 metres to which you can add a white scrim. Please enquire. 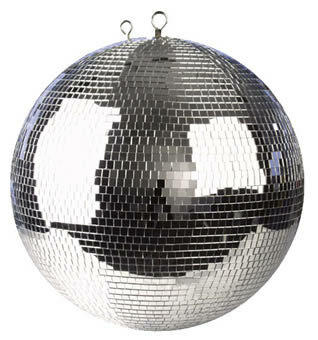 As well as the mirrorball you will need a tight beam style light to illuminate it. 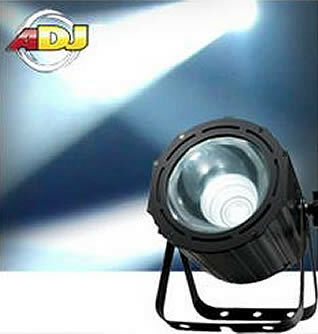 We offer lights of varying strengths suited to different size venues and a small battery powered version. You may also want to consider illuminating the ball from different angles for maximum effect so a second light is often a good idea. You will need to consider where to suspend the light(s) from – if this is not easy in your venue we can also supply additional lighting stands for this if required.